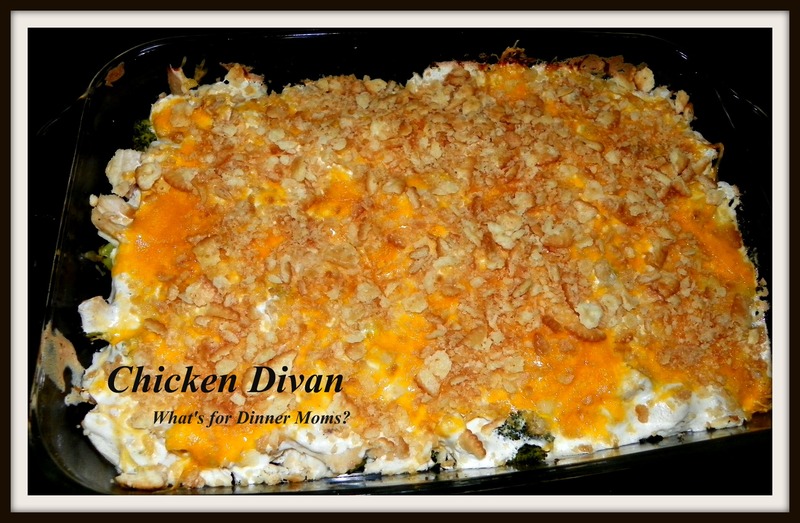 Chicken Divan – What's for Dinner Moms? I normally don’t post on Saturday or Sunday but I didn’t have enough hours in the day yesterday to post this Chicken Divan dish that we had Thursday night so I wanted to make sure I got it in today. A few months ago I made a Pork Divan because what I thought was chicken actually turned out to be pork steaks. Not one for throwing food away or wanting to completely overhaul dinner at the last-minute I went with it. It was delicious. I have more than enough chicken this month so I decided it was time to make the Chicken Divan. I actually prepared the casserole Wednesday night when I had a bit of spare time. I covered it with aluminum foil and placed it in the refrigerator, once it had cooled some. Just before I was ready to make dinner last night I pulled it out of the refrigerator, uncovered it and placed it in the oven. Yummy! I was so glad I made this casserole the night before. It was just fine sitting in the refrigerator overnight until it was time to put it in the oven. This was one of our To-Go dinners and I forgot to snap a picture in our divided dishes. I served the casserole over Buttered Egg Noodles with a side of sliced, raw, red peppers. Poach chicken in a large pan of water with 2 teaspoons of garlic powder. Once chicken is cooked remove from pan and allow to cool before cutting it into bite size pieces. Preheat oven into 350 degrees. Spray a 13 x 9 pan with non-stick spray. Saute the onion and celery in 1 TBSP of butter until softened and onions are turning translucent. Add 3 TBSP of butter to the saute pan when the onion and celery is cooked. Once it is melted sprinkle the flour over the butter. Stir continually until a paste is formed and it turns lightly brown. Slowly add in the half and half to the flour mixture continually whisking to keep smooth. Allow milk to come to a simmer (but not boil!) and stir continually for about 5-8 minutes until the mixture starts to become thick. This will feel like it is never going to happen and then once it starts it happens very quickly so watch the mixture carefully. Once the mixture has thickened remove the pan from heat and stir in the mayonnaise and Dijon mustard. Season well with salt and pepper to taste. Add broccoli to the bottom of the casserole pan. Sprinkle the cooked chicken over the broccoli. Then pour the white sauce over the entire pan spreading it evenly over the entire mixture. Sprinkle the cheddar cheese over the top of the casserole. Melt 1 TBSP of butter in a small bowl in the microwave. Add the crushed crackers to the butter and stir well. Sprinkle crackers evenly over the top of the casserole. Bake at 350 for 30 minutes or until heated through. Let the casserole rest for 5 minutes after removing from oven to set.